This ethnographical museum is located in the tower of a medieval fortress, it offers to the visitor a resume of the Galician traditions and professions, from a recreation of an antique kitchen, an exhibition of farm tools, baskets, wooden flat shoes, to a collection of medieval helmets, armors, knifes, daggers, revolvers…. The visitor can also see the tower from the Renaissance period, built in the XVI century and a chapel from the XVIII century, with an altarpiece from the Renaissance. 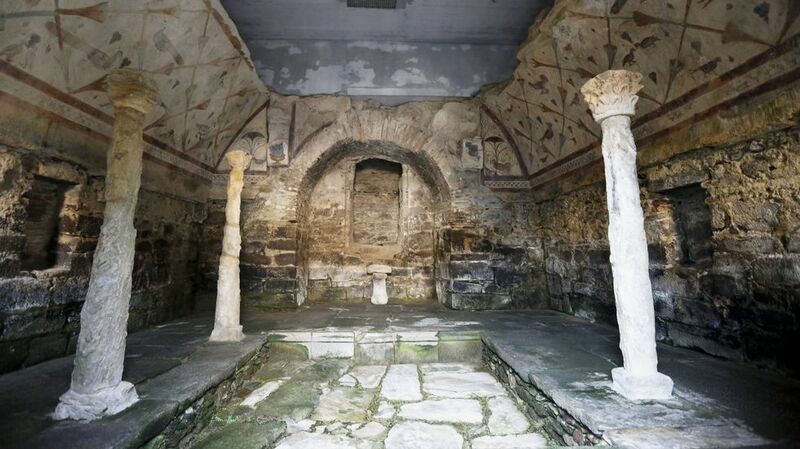 Nearby Lugo we find a jewel from the end of the Roman art, the sanctuary of Santa Olalla de Boveda. It dates from the III – IV century A.D., it was dedicated to the agriculture goddess Cibeles, and later, reconverted to the Christianity to the cult of Santa Eulalia. This temple was hidden in the church’s crypt and it was only discovered in 1926, when the priest wanted to make some remodeling in the church and he found the roman temple. It is a unique temple in the Roman Hispania, it had two floors, but only it remains the ground floor. This sanctuary worked as a “Tauribolio”, that is, in this temple were made bull’s sacrifices to the Gods. The frescos, which represent sibyls in the form of birds, the sculptures and the temple itself, are some of the few that remain in the Iberian Peninsula from the Roman period.